Arctic Race is Novomatic’s newest snowy slot game! This video slot is all about sled dog racing. The sport of mushing is extreme to say the least. It’s popular in the arctic regions of north America, Greenland and some European countries, like Norway. There are a few famous races that are still going today. The races are held over several days and range over 1,000 km! The races have big prize money – just like this video slot game. Arctic Race has a bonus round that you can get at any time! When you play the bonus round, you have the opportunity to win gold trophies and each trophy comes with a big, cash prize! The colour scheme of this slot game is quite simple – with mostly blues, gold, black and white. You can see the arctic landscape, complete with mountains and snow and huskies. Huskies are popular dogs for sledding, as are Alaskan Malamutes, Greenland dogs and Eskimo dogs. 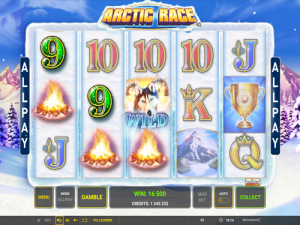 Arctic Race slot game has 5 reels and infinite paylines because it’s an Allplay slot. Well, that doesn’t mean there are infinite paylines but there are over 200 ways to win! Unlike a real dog sled race, you can play this slot game in automatic mode. Arctic Race also has the signature Novomatic gamble game. This doggy slot game will appeal to players who enjoy other Novomatic video slots, especially: Winter Queen, Bear Tracks, Wild Rescue and Ice Queen. Normally the rules of Novomatic slots are tied to paylines but the rules of Arctic Race are pretty simple. Since there are no paylines and every line is technically a potential payline, you want to just be on the lookout for symbols that match! There are 10 ‘normal’ symbols and every one of these can award a 3-match payout, a 4-match payout and a 5-match payout. When you spin the reels of this Novomatic Casino game, keep your eyes on the leftmost reel. This is where the first match needs to land. The other matching symbols need to follow consecutively. 3 matches, one on each of the 1st 3 reels, will award the 3-match payout for the relevant symbol. 4 matches, one on each of the reels 1-4, will award the relevant 4-match payout. One matching symbol on each reel in the game will award the corresponding 5-match payout! The musher is the symbol that has the highest payouts of all the symbols. He’s dressed in a thick winter jacket, a scarf and goggles. The next highest payouts come from the mountain symbol, followed by the sled and the campfire symbols. There’s a very cute, sleeping dog on the sled! The smallest payouts are awarded for the A, K Q, J, 10 and 9, just like the smallest payouts at Sizzling Hot Deluxe. In addition to these normal symbols, there’s also a Wild symbol. It’s three huskies, who are all looking very happy! This is a typical slot machine Wild symbol in that it can behave like a substitute symbol. Any symbol, except the Scatter symbol, can be replaced by the Wild. There’s a bonus race in Arctic Race online slot and it gives you the opportunity to finish on the podium! To trigger this bonus race, you need to do well in the Arctic Race! If you spin the reels and you see 3 golden trophies (anywhere on the reels) – you’ll be able to get racing! The golden trophy is the Scatter symbol and it gives you cash and triggers the bonus feature! The bonus feature is played on the same reels but with different rules! You start off with 3 Free Spins but the normal symbols don’t count. The only symbol you want to appear on your reels is the golden trophy symbol. If no golden trophies land on the reels, your Free Spins total will go down to 2 and so on until the feature ends. If you do land a golden trophy, the Free Spins total is set back to 3! Plus, each golden trophy awards a super massive win. The bonus feature will keep going until either you fill all of the positions on the reels with golden trophies or you run out of spins.